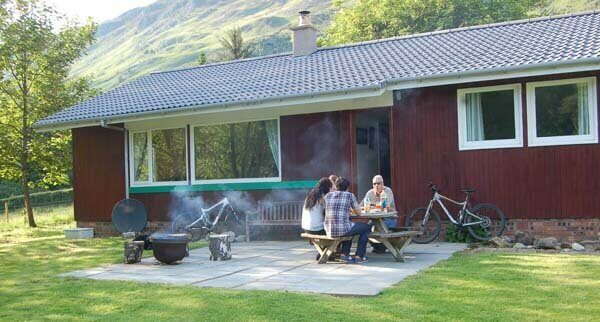 Dornoch Lodge is situated 3 miles into Glenlyon, Scotland's longest glen, and just 12 miles outside of the market town of Aberfeldy. Glenlyon abounds in history and from the moment of entering the glen through the narrow pass you will be enchanted by its spell. Known by one of its Gaelic names as 'The Crooked Glen of the Stones', the road from Fortingall winds through a narrow pass and continues through 26 miles of intoxicating beauty. The further you drive the wilder it gets with high mountains and mixed woodland. At the entrance to the glen is the thatched village of Fortingall, reputed to be the birthplace of Pontius Pilot and home to the Fortingall Yew; at 3000 years old it is the oldest living vegetation in Europe. The village hotel serves delicious food and has a lively bar with traditional music on a Friday night and a cosy feel with the log fire. Midway up Glenlyon is the Shop, Post Office and Tea Room serving delicious homemade scones and cakes: a must for any visit! Aberfeldy has a fabulous selection of shops and cafes, with a wonderful deli full of heaps of delicious local produce, a supermarket for the rest of the essentials and lovely gift shops. At Highland Safaris you will receive preferential rates for the award winning activities there which include Land Rover Safaris, Red Deer Encounter and Gold Panning. Bike and fishing rod hire is also available along with fabulous riverside and forest walks and bike trails. Highland Safaris award-winning cafe is perfect for those looking for Scottish produce and home-baking. Those looking for quality attractions will be spoilt for choice as there are a number of 5-star visitor experiences in the area including Dewar's World of Whisky, The Scottish Crannog Centre (a fascinating re-construction of an Iron Age Dwelling), the magnificent Blair Castle and sublime shopping experience, The House of Bruar (referred to locally as 'the Harrods of the North'!). Other attractions include Castle Menzies (c9 miles), the famous 'Birk's of Aberfeldy' (a wooded walk around a magnificent waterfall), a number of stunning gardens and Pitlochry Festival Theatre. 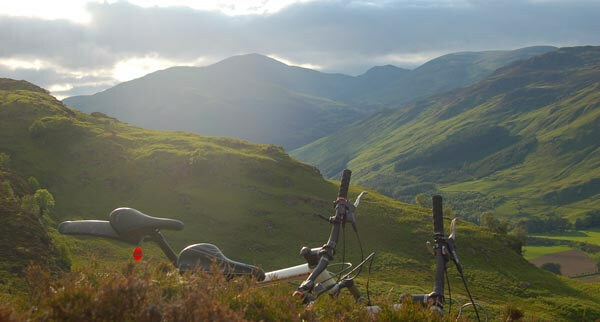 The location is particularly outstanding for cycling and mountain biking with an abundance of quiet roads, forest trails and riverside routes as well as more challenging terrain for experienced riders. Golfers are exceptionally well catered for with many quality courses within easy travelling distance. Water sports enthusiasts, walkers, wildlife lovers and those simply seeking total relaxation surrounded by beautiful scenery, will find everything they need and more in this quite unique and special place. Newly refurbished, this authentic wooden lodge is nestled in an open meadow surrounded by soaring mountains and wild tumbling burns. 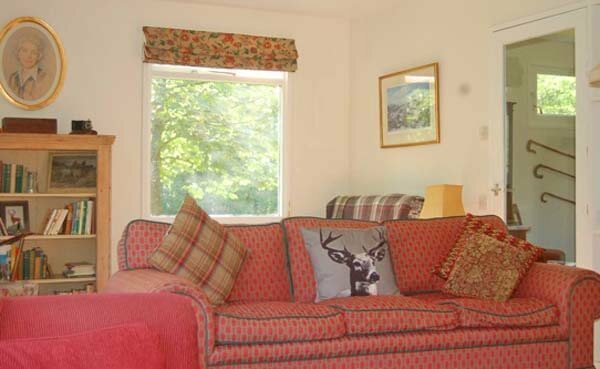 This hugely comfortable 'home from home' has a wonderful welcoming feel, oozing with warm Highland charm that you will feel as soon as you enter. All the rooms are on one level and the lodge comprises of a utility entrance hall, sitting room with woodburning stove and a large kitchen/dining room. 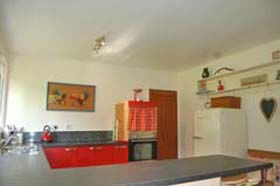 The kitchen is well-equipped and fully fitted with fridge/freezer, dishwasher, and microwave. 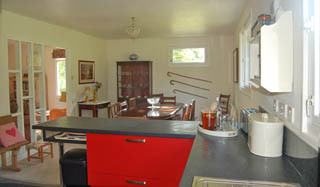 Also, there is a washing machine, small freezer and hanging rail in the utility/entrance hall. The sleeping accommodation is spacious and well laid out with 2 king size bedrooms (1 en-suite shower room), 2 single bedrooms, a twin bedroom and a family bathroom with power shower. There is plenty of room for extended families or a group of friends. Outside is a large natural garden with a paved, sunny patio area - ideal for al fresco dining and barbeques. The garden is enclosed with a gate and usually cows graze the surrounding meadows. Go for the total chill-out experience in the separate sauna with outdoor shower to round off the perfect break. From the south drive up the A9 from Perth, continuing northwards on the A9 towards Ballinluig. Turn onto the A827 to Aberfeldy. Once you have arrived in Aberfeldy, turn right at the traffic lights (signed for the B846 Kinloch Rannoch). After approximately 6 miles, take the left turn at the village of Coshieville signed for Fortingall. Drive through Fortingall (approximately 3 miles from turnoff) and go straight on for approximately half a mile to the right turn signed for Glenlyon. Carry on up this road passing 2 cottages on your right. 150m after passing the second one turn right through a large metal gate. Follow the track for 150m to Dornoch Lodge. From the north, head south on the A9 and take the turning at Ballinluig, then follow the directions above. From the west, follow the A85 to Killin and then follow the A827 north loch road for approximately 14 miles to the village of Fearnan and take the left turn signed for Fortingall and Glen Lyon. Follow this road for approximately 2 miles then take a left turn, signed for Glen Lyon. Carry on up this road passing 2 cottages on your right. 150m after passing the second one turn right through a large metal gate. Follow the track for 150m to Dornoch Lodge. Off peak electricity is included, standard electricity is charged at cost. 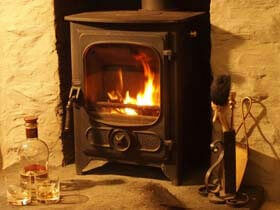 Logs for the wood burning stove are included as well as peat and kindlers. Down duvets, bed linen and towels are provided. 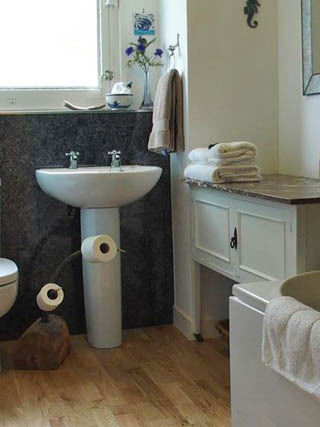 Complimentary toiletries, wildlife information and binoculars, walking and cycling maps and route guides. 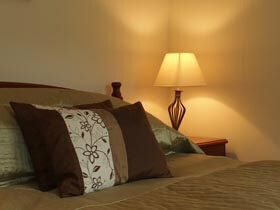 Dornoch Lodge is rented out March - Nov. Change over day is Friday. Short breaks may be available at short notice. Guests receive preferential rates at Highland Safaris (near the village of Dull) for Land Rover Safaris, Red Deer Encounter and Gold Panning. Guests will also receive a 'Safari Pass' discount booklet with 18 special offers for local cafes, shops and activities. 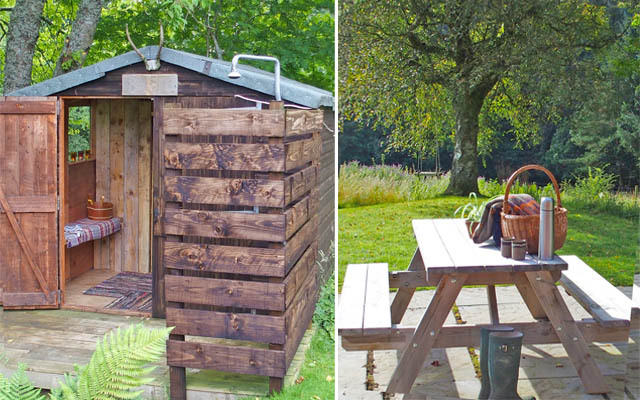 To book this idyllic wooden lodge in Glenlyon, click the enquiry button below and see availability and prices. 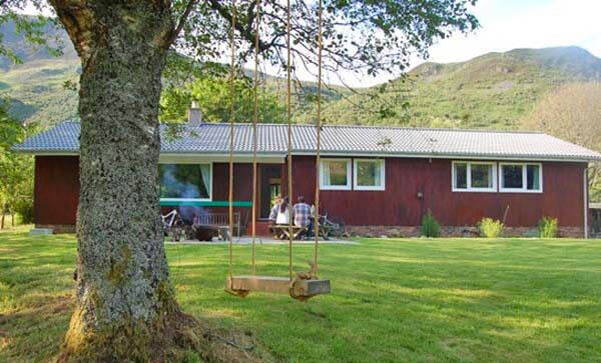 Situated in one of Scotland's most beautiful glens, this Glen Lyon holiday cottage is perfectly situated to explore Aberfeldy and Fortingall as well as the stunning glen.